Welcome, thanks for stopping in! 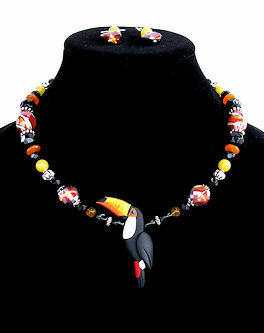 All artwork and jewelry seen here is handsculpted by clay artist Alicia Merritt. 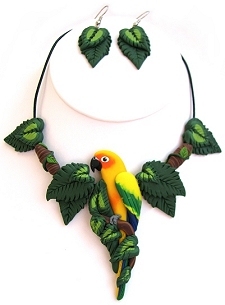 Alicia's passion for parrots is evident in every unique piece of jewelry she sculpts. 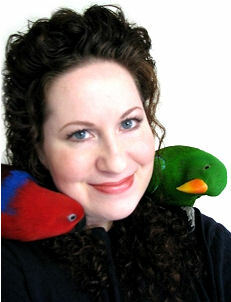 Alicia has sculpted thousands of items for her customers which include collectors, pet stores, and pet lovers worldwide! Each item is one of a kind and unique, and Alicia specializes in custom creations! 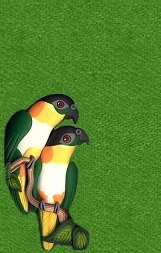 Over EIGHTY species of parrots are showcased on this site, and the list is constantly growing! Please choose from the links at left, and enjoy your visit! The majority of Alicia's work is custom ordered, so she keeps very little inventory. 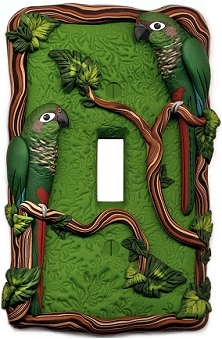 To see what is available for sale right now, see the Creations In Stock page. To be informed of Alicia's sales, monthly auctions, giveaways, and other news, be sure to sign up for the email newsletter! To browse the website by ITEM, click on the links below, or to view examples in particular bird species, go through the SPECIES LIST. Click on photos below for more details, photos and pricing. Alicia has launched a NEW Jewelry Line! Copyright © 2001-2014 Alicia's Creations All rights reserved.